EFG Bank has been unveiled as the first Official Partner of the Mission Hills Junior Golf Program in a deal that sees the Swiss private bank join forces with the Mission Hills Group to extend both parties’ commitment to emerging talent in Greater China. 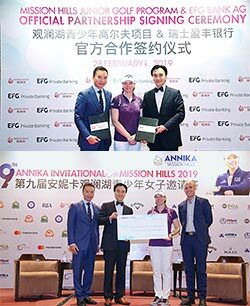 The partnership was announced during the ninth ANNIKA Invitational at Mission Hills Shenzhen resort in southern China and witnessed by 10-time Major Champion Annika Sorenstam. The all-girls event is one of more than 50 junior tournaments staged by Mission Hills across its two locations, which span 40 square kilometers and 22 golf courses, making it the world’s largest golf facility. With its regional headquarters in Hong Kong, EFG Bank has a strong track-record of supporting golf in the region. Hong Kong’s first Olympic golfer, Tiffany Chan – also the first Hong Kong player on the LPGA Tour – is Global Sport Ambassador. 25-year-old Chan has received backing from EFG since her junior days through the EFG Young Athletes’ Foundation, which now supports 15-year-old Chloe Chan, a member of the Hong Kong national golf team, and talented showjumper Vincent Capol, also from Hong Kong. The Swiss private bank is also title sponsor of the EFG Hong Kong Ladies Open for the third consecutive year, which returns to the Hong Kong Golf Club in Fanling on May 10-12. The winner of the 2019 ANNIKA Invitational will be offered a start in the fifth edition of the professional Tour event. Photo 1: Tenniel Chu (left), Group Vice Chairman, Mission Hills and Albert Chiu (right), Executive Chairman, Asia Pacific, EFG Bank announce EFG’s sponsorship of the Mission Hills Junior Golf Program in China. The signing ceremony took place during the ninth ANNIKA Invitational all-girls tournament at the Mission Hills Shenzhen resort with golfing legend Annika Sorenstam (centre) also in attendance. Photo 2: Albert Chiu (second from left), Executive Chairman, Asia Pacific, EFG Bank presents an exemption into the EFG Hong Kong Ladies Open for the winner of the 2019 ANNIKA Invitational at Mission Hills to golfing legend, Annika Sorenstam (third from left), Mission Hills Group Vice-Chairman, Tenniel Chu (far left) and Patrick Quernemoen (right), COO of the PGA of America Golf Academies at Mission Hills. The Mission Hills Junior Golf Program provides access to the sport for tens of thousands of juniors each year, from beginners to elite amateurs, through junior tournaments, coaching, camps and clinics, schools initiatives, free access for juniors to three of its courses and free entry into the Dr. David Chu Golf Museum at Mission Hills, the first in China. Founded in 1992, Mission Hills has invested more than six million US dollars into its Junior Golf Program; and more than 100,000 competitive rounds have been played by juniors at Mission Hills. It was voted Best Youth Development Program in Asia at the 2018 Sport Industry Awards. EFG joins a family of Mission Hills supporters which includes The R&A and the PGA of America, plus golfing greats Sorenstam, Jack Nicklaus and Sir Nick Faldo, all of whom stage their global junior events at Mission Hills. EFG is the first Official Partner of the Mission Hills Junior Golf Program. The fully-integrated Mission Hills resorts span more than 40 square kilometres, including 22 championship golf courses, five-star hotels, award-winning spas and volcanic mineral springs, international convention centers, state-of-the-art golf academies, a 20-pitch football training base, Asia’s largest basketball school and Asia’s biggest tennis facility. EFG International is a global private banking group offering private banking and asset management services and is headquartered in Zurich. EFG International's group of private banking businesses operates in around 40 locations worldwide. Its registered shares (EFGN) are listed on the SIX Swiss Exchange.